Starting with version 1.3, you can add custom images or Genericons font icons to your buttons or links. To use your image, please select Custom (your url to image) from the Select button icon dropdown. 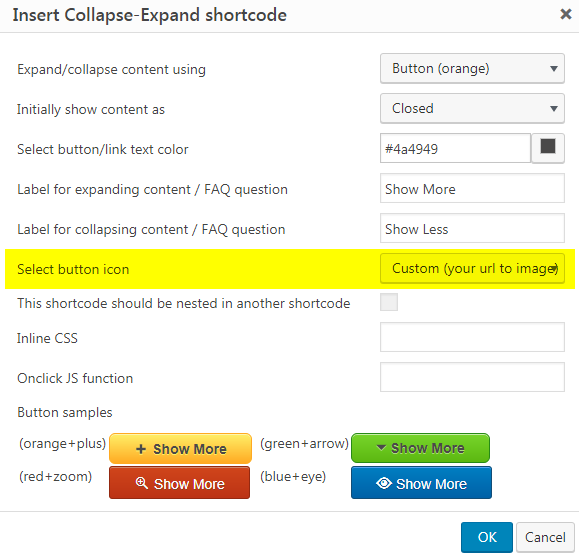 Then specify your image URL in the custom_icon_url shortcode parameter. For a detailed explanation, please see a screencast below. In order to use one of the Genericons font icons, please follow the steps above, but in the custom_icon_url shortcode parameter enter the unicode value of the needed font icon without “f/”, e.g. custom_icon_url=”300″ for the comment icon ( ). For a list of unicode values, please see this link. From version 1.3.1, you can also place icons before or after the link or button text using the custom_icon_position=”before” or custom_icon_position=”after” shortcode parameter.